Zynga's new motto seems to be "bigger is better," as every new feature in ChefVille seems to be bigger than the one before. While you're likely still working on the Healthy Eating event (which expires in less than two days, mind you), there's already a new sushi-themed event that will unlock the final set of dishes within the Sushi Master Station. There are three new timed quests in the "Best of Sushi" event, and we're here with a look at them to get you started. Lanterns are earned by sending individual requests to your friends. Meanwhile, both of these required dishes are only available to cook within the Sushi Master Station, and only after you've unlocked its Expert set of dishes. As we told you in our guide to the "Expert Sushi Master" quests, this final upgrade forces you to collect quite a few masks from friends, so check out our complete guide for more. Once you unlock these two dishes, the Oshi Sushi can be prepared with five Salmon, four Sushi Rolls, and one Soy Sauce. Remember, the Sushi Rolls are complex crafting recipes already, as you'll need to first make a ton of Sushi Rice to prepare them. As for the Soy Sauce, this is a recipe made inside the Asian Sauce Station with Soy Beans, Water, and Salt. Meanwhile, the Spicy Tuna Roll (not to be confused with a basic Tuna Roll) requires three Tuna, three Sushi Rolls, and two Wasabi to create. Wasabi can be created inside the Rinser using one Wasabi Root and one Water each. There's a huge time investment required for these quests, but you'll only have three days to finish them off. We wish you the best of luck in finishing them. If you're like us, you're going to need it. 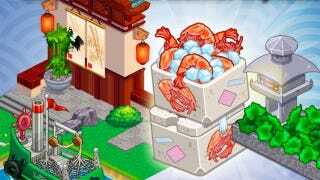 Have you already upgraded your Sushi Master Station to the expert level? Do you think you're going to be able to finish these quests within the three days available? Sound off in the Games.com comments!